I got this hardcover at the local library's annual book sale, for another release copy. It's the wonderfully bizarre choice of examples that really thrill me. 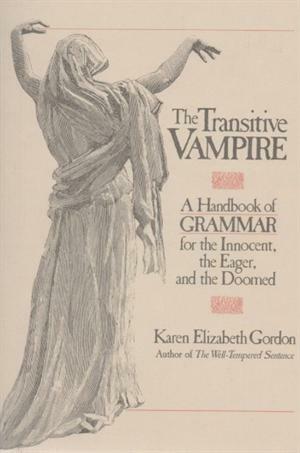 This book is subtitled "a handbook of grammar for the Innocent, the Eager, and the Doomed," and it's a perfectly usable grammar reference - but to illustrate, say, demonstrative adjectives, Gordon uses "this contretemps, those rhapsodies, that samovar, these mishaps". Later on the examples get more elaborate, as do the tales we imagine they must have come from: "Not the vampires but the sandman has made a mess of this schloss." "The hand that is languishing on the windowsill once was mine." The tone of these little tidbits of knowledge reminds me very much of Edward Gorey; I'd love to know whether he influenced Gordon at all. I expect they'd have enjoyed each other's work, in any case!